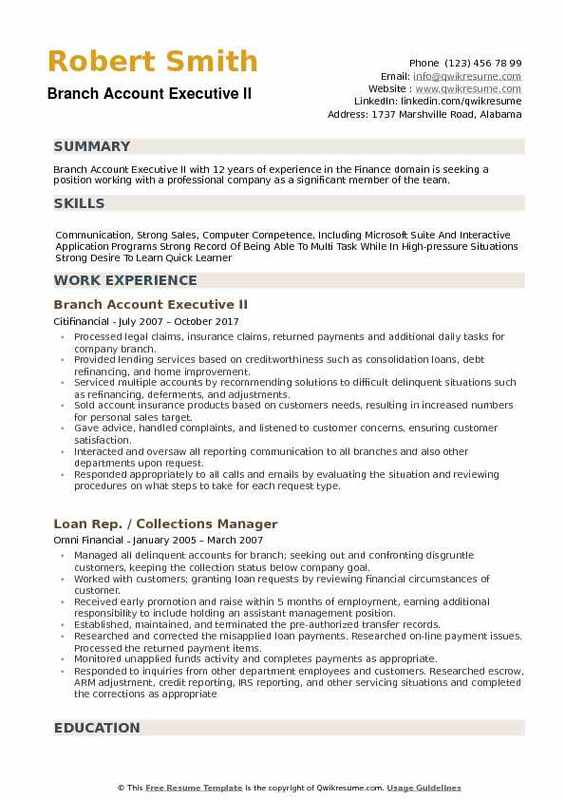 A Branch Account Executive’s main job is to sell various products which are assigned to the branch, the other duties for a branch account executive include – meeting sales quota, training the newly recruited accounting staff, cold calling, building long-term customer relationship, negotiating and fixing rates on behalf of the branch, problem-solving, fixing appointments with prospects and finalizing the deals. 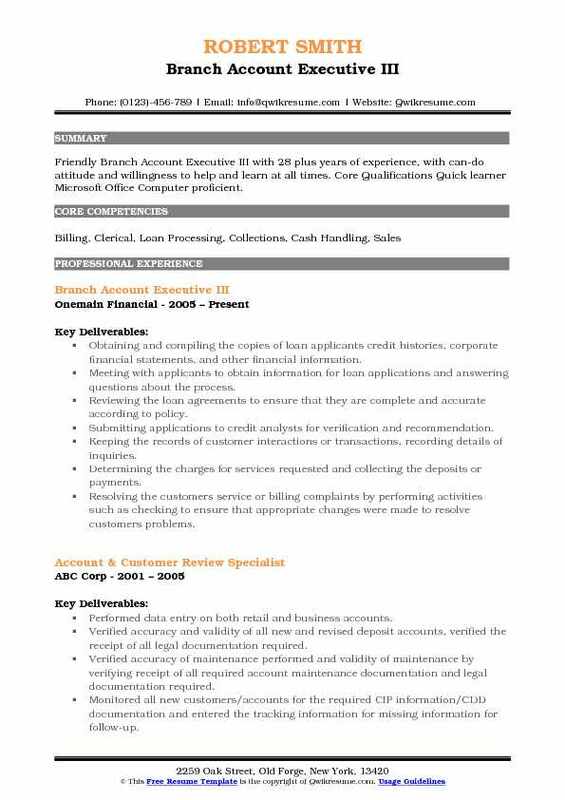 Employers look out for Branch Account Executive Resume sample that showcases excellent negotiation skills and communicative traits. Individuals with a Bachelor’s degree in Accounting, Marketing or finance are eligible to apply for this post and to other related positions like Branch accountant, account Executive and accounts officer. 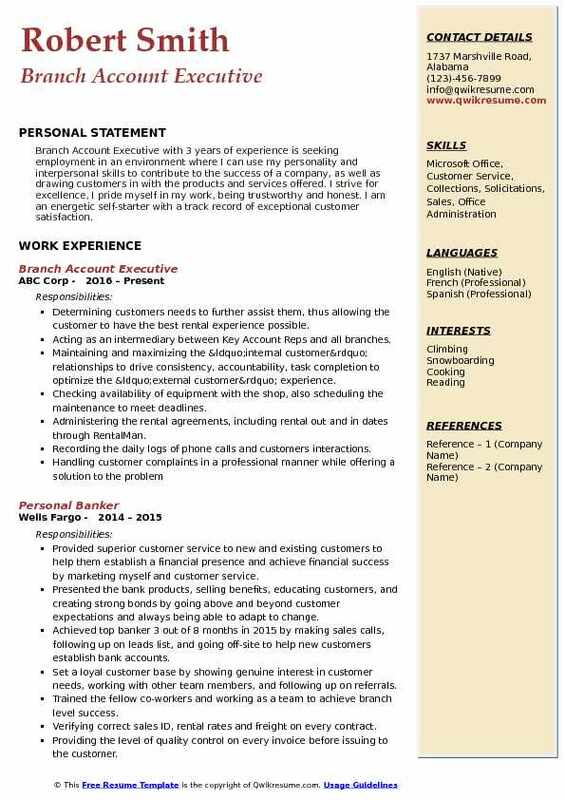 Summary : Branch Account Executive with 8 years of experience is seeking a position with a company that offers opportunity to grow within, utilize my extensive training, and acquire new skills. Skilled at producing results in fast paced environments by adapting and implementing innovative strategies. Who aggressively builds solid client bases and drives revenue growth. Personable and ambitious specializing in portfolio implementation and client services. Assessing the clients financial situations to develop strategic financial planning solutions. Following all compliance department policies to eliminate procedural errors and margin breaks. Recommending loan approvals and denials based on customer loan application reviews. Originating, reviewing, processing, closing and administering the customer loan proposals. Submitting the loan applications to the underwriter for verification and recommendations. Maintaining the strict confidentiality of bank records and client information. Complying with regulatory requirements, including the bank secrecy act, anti-money laundering, etc. Reviewing the collection reports to determine the status of collections and the amounts of outstanding. Modelling exceptional customer service skills and appropriate diagnostic sales techniques. Following up with the insured individuals regarding premium and deductibles payments. 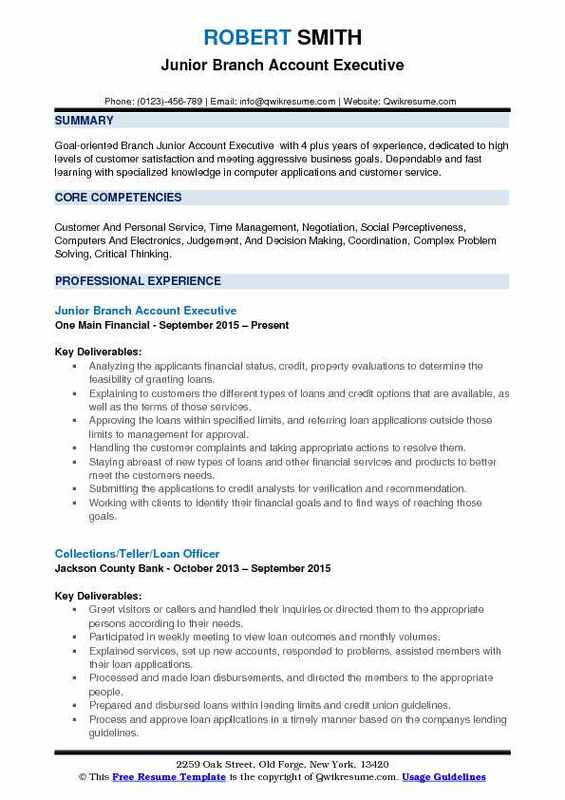 Objective : Goal-oriented Branch Junior Account Executive with 4 plus years of experience, dedicated to high levels of customer satisfaction and meeting aggressive business goals. Dependable and fast learning with specialized knowledge in computer applications and customer service. Skills : Customer And Personal Service, Time Management, Negotiation, Social Perceptiveness, Computers And Electronics, Judgement, And Decision Making, Coordination, Complex Problem Solving, Critical Thinking. Analyzing the applicants financial status, credit, property evaluations to determine the feasibility of granting loans. Explaining to customers the different types of loans and credit options that are available, as well as the terms of those services. Approving the loans within specified limits, and referring loan applications outside those limits to management for approval. Handling the customer complaints and taking appropriate actions to resolve them. Staying abreast of new types of loans and other financial services and products to better meet the customers needs. Submitting the applications to credit analysts for verification and recommendation. Working with clients to identify their financial goals and to find ways of reaching those goals. Negotiating the payment arrangements with customers who have delinquent loans. Performing a wide range of services including document preparation, personal loan servicing/maintenance, and problem resolution. 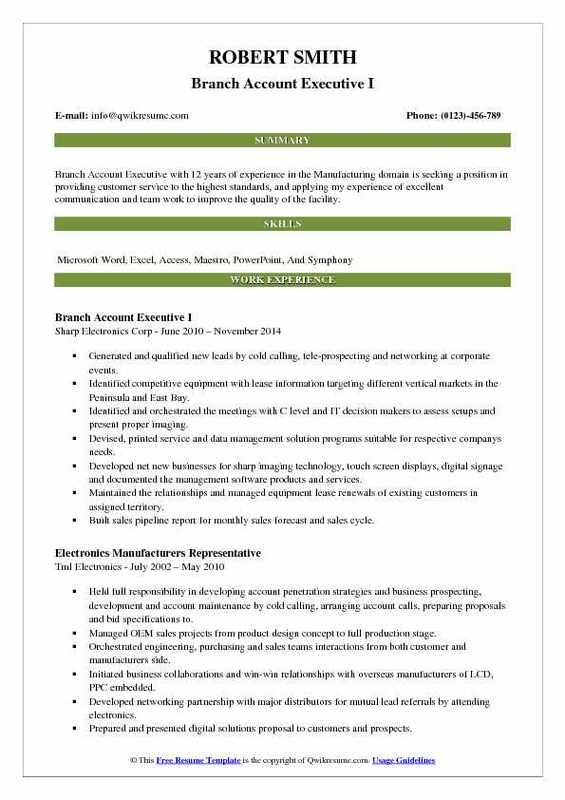 Summary : Branch Account Executive with 12 years of experience in the Manufacturing domain is seeking a position in providing customer service to the highest standards, and applying my experience of excellent communication and team work to improve the quality of the facility. Generated and qualified new leads by cold calling, tele-prospecting and networking at corporate events. Identified competitive equipment with lease information targeting different vertical markets in the Peninsula and East Bay. Identified and orchestrated the meetings with C level and IT decision makers to assess setups and present proper imaging. Devised, printed service and data management solution programs suitable for respective companys needs. Developed net new businesses for sharp imaging technology, touch screen displays, digital signage and documented the management software products and services. Maintained the relationships and managed equipment lease renewals of existing customers in assigned territory. Built sales pipeline report for monthly sales forecast and sales cycle. 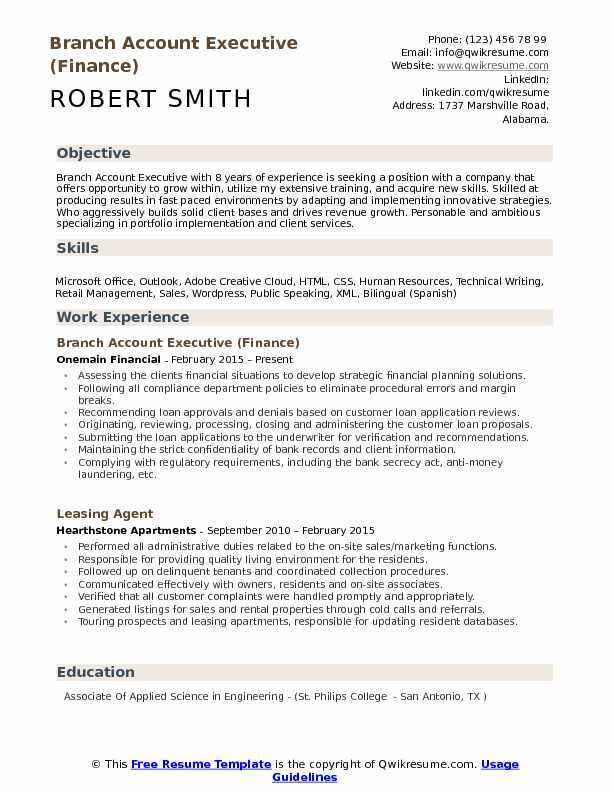 Summary : Branch Account Executive with 8 years of experience in the Finance domain is seeking to obtain a position in the banking industry that will enable me to utilize my experience, strong organizational skills, educational background and ability to work well with people. Consulting with the customers about their financial and personal objectives and offer loan solutions to help them achieve their goal. Effectively identifying the customer credit needs and providing appropriate loan solutions. Providing exceptional service to ensure customer satisfaction and a continued relationship with Onemain financial. Working as an individual contributor and as part of a team to achieve business/organizational goals. Working directly with customers through the entire lending cycle from loan application to loan closing. Offering credit union products and services that would benefit the member. 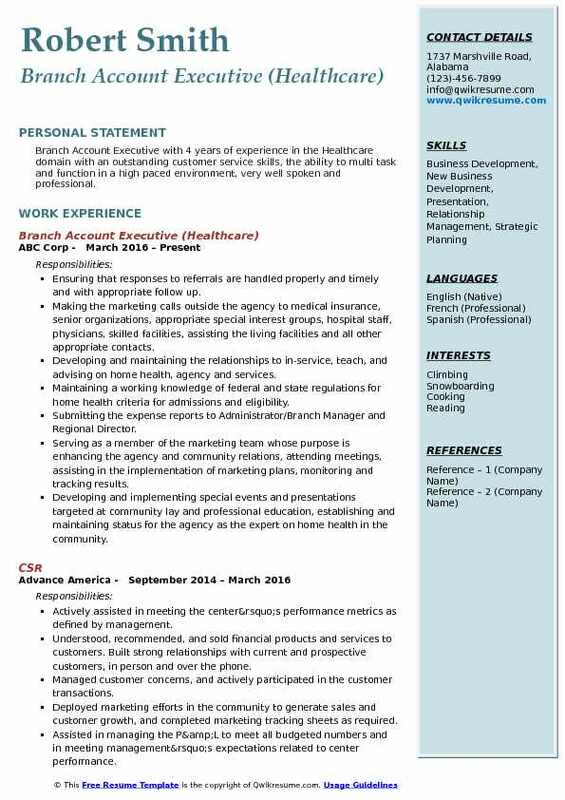 Objective : Branch Account Executive with 4 years of experience in the Healthcare domain with an outstanding customer service skills, the ability to multi task and function in a high paced environment, very well spoken and professional. Ensuring that responses to referrals are handled properly and timely and with appropriate follow up. Making the marketing calls outside the agency to medical insurance, senior organizations, appropriate special interest groups, hospital staff, physicians, skilled facilities, assisting the living facilities and all other appropriate contacts. Developing and maintaining the relationships to in-service, teach, and advising on home health, agency and services. Maintaining a working knowledge of federal and state regulations for home health criteria for admissions and eligibility. Submitting the expense reports to Administrator/Branch Manager and Regional Director. Serving as a member of the marketing team whose purpose is enhancing the agency and community relations, attending meetings, assisting in the implementation of marketing plans, monitoring and tracking results. Developing and implementing special events and presentations targeted at community lay and professional education, establishing and maintaining status for the agency as the expert on home health in the community. Summary : Branch Account Executive 2 with 10 years of experience in the Finance domain is seeking to obtain a position that allows me to utilize my financial experience, leadership and administrative abilities, organizational and customer service skills. Responsible for processing mortgage payments, escrow payments, and loan payments by phone, internet, or in person. Assisted in delinquency control for over 9 million in outstanding account balances. Responsible for meeting individual and office goals including but not limited to new money loaned, insurance sales, and delinquency. In charge of processing all returned payments in compliance with company policies. Processed auto lien recordings in accordance to Georgia state compliance. Assisted in training of all new employees as well as seasoned employees on the new software that was implemented companywide in 2012 as well as a company-wide merger in 2017. Developed new and retained existing customers, and be included in the process of improving the bank’s product offerings. 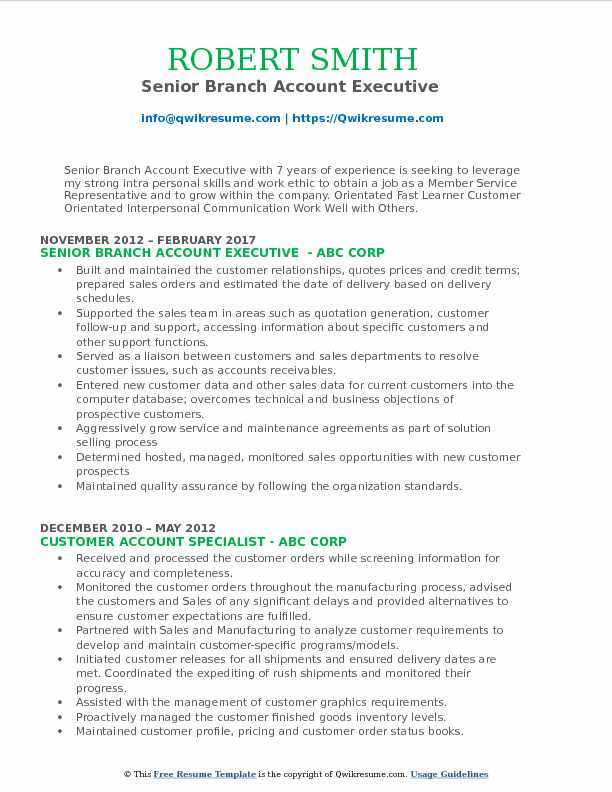 Summary : Senior Branch Account Executive with 7 years of experience is seeking to leverage my strong intra personal skills and work ethic to obtain a job as a Member Service Representative and to grow within the company. Orientated Fast Learner Customer Orientated Interpersonal Communication Work Well with Others. Built and maintained the customer relationships, quotes prices and credit terms; prepared sales orders and estimated the date of delivery based on delivery schedules. Supported the sales team in areas such as quotation generation, customer follow-up and support, accessing information about specific customers and other support functions. 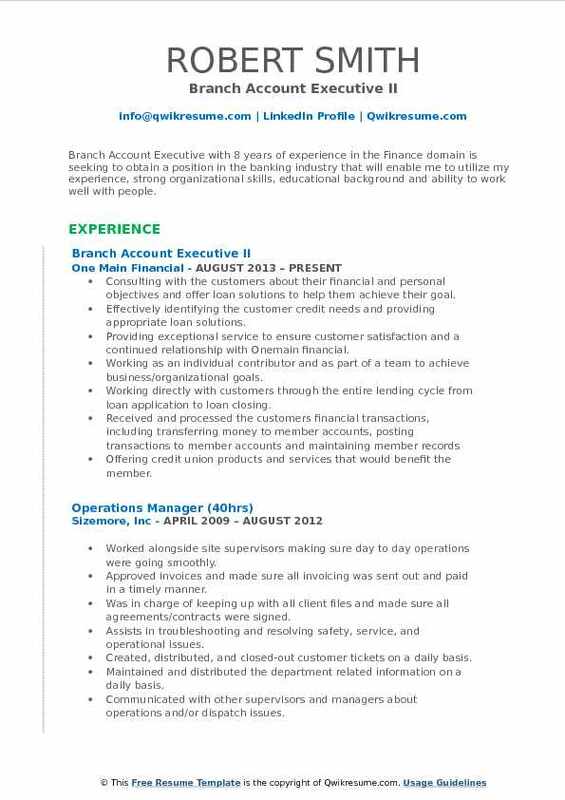 Served as a liaison between customers and sales departments to resolve customer issues, such as accounts receivables. Entered new customer data and other sales data for current customers into the computer database; overcomes technical and business objections of prospective customers. Maintained quality assurance by following the organization standards. Assisted with other Sales projects as assigned by General Manager. Summary : Friendly Branch Account Executive III with 28 plus years of experience, with can-do attitude and willingness to help and learn at all times. Core Qualifications Quick learner Microsoft Office Computer proficient. Obtaining and compiling the copies of loan applicants credit histories, corporate financial statements, and other financial information. Meeting with applicants to obtain information for loan applications and answering questions about the process. Reviewing the loan agreements to ensure that they are complete and accurate according to policy. Submitting applications to credit analysts for verification and recommendation. Keeping the records of customer interactions or transactions, recording details of inquiries. Determining the charges for services requested and collecting the deposits or payments. Resolving the customers service or billing complaints by performing activities such as checking to ensure that appropriate changes were made to resolve customers problems. Maintaining the knowledge of current sales and promotions, policies regarding the payment. 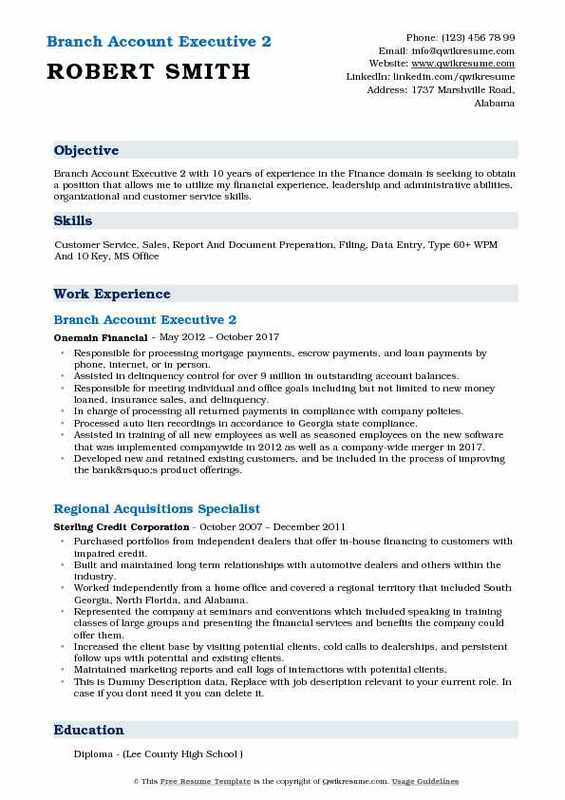 Objective : Branch Account Executive with 3 years of experience is seeking employment in an environment where I can use my personality and interpersonal skills to contribute to the success of a company, as well as drawing customers in with the products and services offered. I strive for excellence, I pride myself in my work, being trustworthy and honest. I am an energetic self-starter with a track record of exceptional customer satisfaction. Determining customers needs to further assist them, thus allowing the customer to have the best rental experience possible. Acting as an intermediary between Key Account Reps and all branches. Maintaining and maximizing the “internal customer” relationships to drive consistency, accountability, task completion to optimize the “external customer” experience. Checking availability of equipment with the shop, also scheduling the maintenance to meet deadlines. Administering the rental agreements, including rental out and in dates through RentalMan. Recording the daily logs of phone calls and customers interactions. Ensuring Key Account rentals are scheduled appropriately and deliveries are complete. Collecting the call off numbers on each rental and ensuring the pickup. Summary : Branch Account Executive II with 12 years of experience in the Finance domain is seeking a position working with a professional company as a significant member of the team. Processed legal claims, insurance claims, returned payments and additional daily tasks for company branch. Provided lending services based on creditworthiness such as consolidation loans, debt refinancing, and home improvement. Serviced multiple accounts by recommending solutions to difficult delinquent situations such as refinancing, deferments, and adjustments. Sold account insurance products based on customers needs, resulting in increased numbers for personal sales target. Gave advice, handled complaints, and listened to customer concerns, ensuring customer satisfaction. Interacted and oversaw all reporting communication to all branches and also other departments upon request. Responded appropriately to all calls and emails by evaluating the situation and reviewing procedures on what steps to take for each request type. Identified and routed the service request information to local branch offices in a timely manner by email and/or telephone. Ensured via email and telephone communications that all client requests are fulfilled locally.